While many artists are known for working with one medium, Faith Ringgold communicates her vision through means as diverse as her sources of inspiration. A powerful narrative examining race and gender is woven throughout the upcoming exhibition, Faith Ringgold: An American Artist, a collection of story quilts, tankas, prints, oil paintings, drawings, masks, soft sculptures, and original illustrations from the artist’s award-winning book, Tar Beach, sewn together with Ringgold’s creativity and storytelling skills. Originally from New York, Ringgold was raised among artists of the Harlem Renaissance, a social, cultural, and artistic movement that emerged out of Harlem, New York. As an adult, she traveled across Europe and visited Ghana and Niger. Ringgold’s exposure to the arts from a young age, political changes of the 1960s, and her travels around the world are reflected in An American Artist, a collection of more than 40 examples of Ringgold’s varied production spanning four decades. Faith Ringgold (American, born 1930), Anyone Can Fly, 1997, Etching 7/20, 17 1/2 x 23 inches © 2018 Faith Ringgold, member Artists Rights Society (ARS), NY / Courtesy ACA Galleries, NY. The exhibition brings Ringgold’s singular voice as an artist, activist, author and teacher to join with others this February during Black History Month in recognition and celebration of African American artists. In recognition of Black History Month and the opening of Faith Ringgold: An American Artist, the Crocker will install a concurrent exhibition of recent acquisitions and promised gifts of art by African American artists. The title of the exhibition takes its name from the poem Still I Rise by acclaimed poet and civil rights activist Maya Angelou. As in Angelou’s poem, we honor the strength and resiliency of African Americans, elevating their voices and highlighting their contributions to art and the Museum’s growing collection. The majority of artists featured in the exhibition worked from 1950 to the present day. Romare Bearden, Beauford Delaney, Hayward Ellis King, Evangeline Juliet “EJ” Montgomery, Betye Saar, Alison Saar, Sam Gilliam, Elizabeth Catlett, Norman Lewis, Richard Mayhew, Faith Ringgold, Alma Woodsey Thomas, Allen Stringfellow, and Mickalene Thomas will all be represented in this exhibition. Black History Month Free Family Festival returns to Sacramento with live performances, hands-on activities, and our community’s one-and-only Black and Beautiful Community Marketplace. The celebration will feature explosive beats by Grant High School’s renowned drumline, drama by Celebration Arts, and a special "Baby, that’s Jazz" presentation exploring African American musical roots and legacy. If that’s not enough, inspired by the history-making Black Panther film, the Festival will explore AfroFuturism in art and music! Get ready to sing-along, call, respond, and most of all celebrate the amazing contributions of African Americans. This event, as well as general admission to the Museum, are free for everyone on February 18, 2018. More information HERE. This spring, the Crocker will host three exhibitions, each devoted to an important American female artist: E. Charlton Fortune, Corita Kent, and Faith Ringgold. Because the dates of these shows overlap, they offer a unique opportunity to explore in depth the subject of women in 20th-century art history. From Fortune’s picturesque Impressionism to Kent’s spiritually infused Pop and Ringgold’s socially engaged quilts, we will explore the unique contributions these women and their sister artists have made to the history of American art. Register HERE. 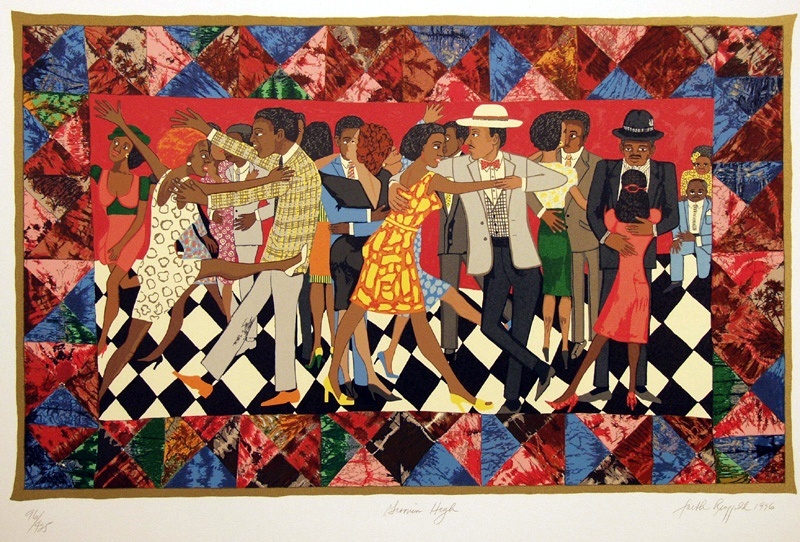 Cover photo: Faith Ringgold (American, born 1930), Groovin' High, 1996, Silkscreen 96/425, 32 1/2 x 44 inches © 2018 Faith Ringgold, member Artists Rights Society (ARS), NY / Courtesy ACA Galleries, NY.